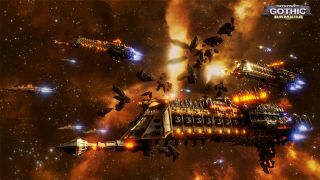 We haven't seen much from the upcoming Warhammer 40,000-based RTS Battlefleet Gothic: Armada since it was announced back in January: Just some screens and a teaser that, while nice enough, wasn't particularly informative. But now we can finally see the thing in action thanks to the debut gameplay trailer that was released today, and I have to say, it looks pretty good. I think we're all mature enough to admit that it also looks a little ridiculous. I mean, who builds ships like these? It's like medieval Düsseldorf floating around in space. But they are awfully pretty, aren't they? More importantly (maybe), the trailer suggests that there will be a good degree of depth to the simulation as well. The Imperium and Chaos ships and fleets each have their own strengths, weaknesses and unique abilities, and the game will feature multiplayer combat and a full single-player campaign against Abaddon the Despoiler. An alpha-state gameplay trailer is a long way from actual hands-on gameplay, but so far I like what I see. Battlefleet Gothic: Armada is currently slated to come out sometime in 2016.